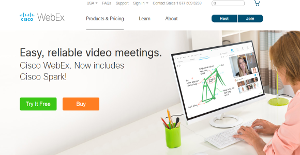 Cisco WebEx is often described as a flexible audio and video conferencing solution designed for businesses of all sizes, and represents a popular web conferencing software that integrates the primary tools that enable users to instantly conduct meetings online which are data, voice, and video. Available in various plans wherein each plan offers a specific capacity of work space and meeting space, Cisco WebEx has the capability to hold multiple meetings providing users a real-time experience. This web conferencing software is also highly recommended for large scale product launches and educational sessions. Its broadcast-quality audio, conference calls, and teleconferencing system allows users to to set up an effective team workspace that enhances group collaboration and brainstorming. Cisco WebEx is also described as a stable platform to hold meetings and works with multiple productivity tools. Cisco WebEx has a feature called WebEx Meeting Center that makes it easy for users to schedule, start, and conduct online meetings. To be able to start a meeting, a user should have a host account as the presenter in a hosted meeting. In scheduling a meeting, a user can prepare an invitation using Microsoft Outlook and then the schedule will be loaded into the Cisco WebEx system by clicking the “Add WebEx Meeting” tab that appears in Outlook. To invite attendees for a meeting, the only information needed by the host or presenter are their email addresses and attendees can join through their phone, computer, or video system. The software is also enabling users to switch instantly from one device to another while an online meeting is on the fly. WebEx Meeting Center facilitates easy access to meetings making attendees as active participants. Cisco WebEx also has its Training Center where maximum collaboration is enhanced. In this feature, the software automatically sets up the screen view depending on the type of file that is being used. For instance, if it’s a PowerPoint Presentation, the screen view will instantly show a slide presentation with all of the needed controls. If it is a video file, a video presentation will automatically load up with video control features. Attendees can edit shared files when they are provided with an assigned role or privilege allowing them to give annotations in real-time to files. This feature enhances brainstorming for a live discussion on topics. Another feature of Cisco WebEx is its Event Center. Through this feature users can organize and conduct events with a capacity of up to 3,000 attendees.A prominent component of this feature is that invitations can be customize as well as the registration site. Events can also be conducted interactively as the software accommodates screen sharing, Q&A, polling, and chat. This feature allows users to effectively promote their brand and business to a large audience. Every enterprise has different requirements and needs a software that can be personalized for their size, kind of workers and buyers, and the particular industry they are in. For these reasons, no system can offer perfect features out-of-the-box. When you try to find a software app, first be sure what you want it for. Read some Cisco WebEx reviews and ask yourself do you desire basic functionality or do you want advanced functionality? Are there any industry-specific tools that you are looking for? Find the answers to these queries to help your search. There are lots of elements that you need to reflect on and these include your finances, particular business wants, your company size, integration needs etc. Take your time, try out a few free trials, and finally choose the app that provides all that you require to improve your company effectiveness and productivity. How Much Does Cisco WebEx Cost? We realize that when you make a decision to buy Video Conferencing Software it’s important not only to see how experts evaluate it in their reviews, but also to find out if the real people and companies that buy it are actually satisfied with the product. That’s why we’ve created our behavior-based Customer Satisfaction Algorithm™ that gathers customer reviews, comments and Cisco WebEx reviews across a wide range of social media sites. The data is then presented in an easy to digest form showing how many people had positive and negative experience with Cisco WebEx. With that information at hand you should be equipped to make an informed buying decision that you won’t regret. What are Cisco WebEx pricing details? What integrations are available for Cisco WebEx? Pros: WebEx is revolutionizing the way we work, communicate and hold meetings to know everything without going to a place away from our community, this software has a great capacity to add participants. Cons: I can not think of something that is wrong, they have done a good job developing WebEx, creating an innovative and futuristic system for companies with workers like us, with clear goals and without loss of time. Pros: I like that it offers simple and intuitive interface, this means that the platform can be used by almost everyone. I like the pop-up explanations of some functions. Also, the instructions for the users are detailed and everyone understands how this system works. We have an information that lot of people within the government agencies and university are using this tool without any concerns. Cons: I have experienced some sound issues, but I think this is more user’s fault than the software’s. On the other hand, there is always room for improvements, especially when it comes to standard settings. If you need more information about Cisco WebEx or you simply have a question let us know what you need and we’ll forward your request directly to the vendor.